Commissioner Richard D. Davison is a veteran criminal justice official who has a background in prosecution, legislative, juvenile justice, corrections, and law enforcement. Commissioner Davison received his Bachelor of Science from Florida State University in 1984 and his Doctor of Jurisprudence from the University of Florida in 1988. While in law school he was an Earl Warren Legal Fellow, a Virgil Hawkins Legal Fellow, and a certified legal intern in the Office of the Public Defender. Commissioner Davison began his criminal justice career in 1989 in Orlando, Florida, where he prosecuted juvenile delinquency, misdemeanor, and traffic cases in jury and nonjury trials as an Assistant State Attorney in the Ninth Judicial Circuit. In 1991, Commissioner Davison became a staff attorney for the Florida House of Representatives Committee on Criminal Justice. Afterward, he became an Assistant Statewide Prosecutor for Florida’s Office of Statewide Prosecution where he prosecuted white collar crime, organized crime, and other criminal enterprises. Following the creation of the Florida Department of Juvenile Justice in 1994, Commissioner Davison served as the Department’s Director of Legislative Affairs and Assistant General Counsel. After a period of time with a law firm as a senior associate and lobbyist, Commissioner Davison returned the Department of Juvenile Justice as the Deputy Secretary. Subsequently, Commissioner Davison transferred to the Florida Department of Corrections (DOC) where he also served as the Deputy Secretary. At DOC he was second in command of the agency and was responsible for the executive oversight of institutions, probation, health services, staff development, and information technology. 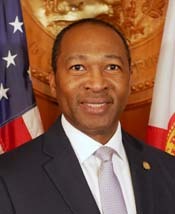 Before his appointment to the Commission, Davison served as Legal Counsel and Director of Administration for the Gadsden County Sheriff’s Office. There he provided advice and counsel on a wide range of legal and administrative issues. Simultaneously, he served as a program coordinator for the City of Tallahassee Community Connections Restorative Justice Program. Commissioner Davison has previously served as a member of the Violent Crime and Drug Control Council, the Florida Supreme Court Task Force on Treatment Based Drug Courts, and the Tallahassee Community College Criminal Justice Advisory Committee. He also served as a member and chairman of the Florida Council on the Social Status of Black Men and Boys. Commissioner Davison currently serves his community as a member the Keiser University Criminal Justice Advisory Committee, as a Counselor for the Florida American Legion Boys State, and as a member of the Leon High School Advisory Board. Commissioner Davison was appointed by Governor Scott and the Cabinet on August 19, 2014, to serve a six-year term which extends until June 30, 2020. His appointment is subject to confirmation by the Florida Senate.